Man, what an explosive ending to one of my favorite series! The Bitter Kingdom is the final book in the Fire and Thorns Trilogy. Elisa has really come full circle in this book. She is a confident and strong leader who has fully developed her pretty awesome powers. 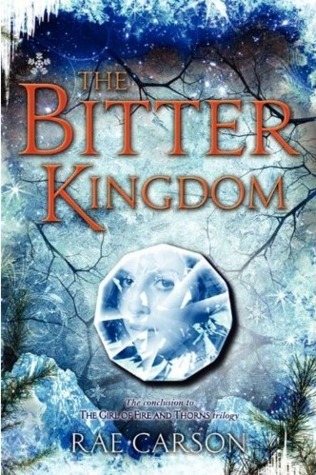 In The Bitter Kingdom, Elisa is on the hunt for the captain of her guard (and the person she is in love with), Hector. The first two books in this series had a ton of action, and this final book did not disappoint. Like the other books in the series, very little of the story takes place in Elisa's palace and a majority of the book is traveling or fighting. This is absolutely a fantasy adventure story. I can't think of one part of this story that lulled- it was fantastic! The love between Elisa and Hector is one of my favorite YA romances. There is so much passion and emotion between the two- and yet they are both strong, independent characters. Elisa and Hector are readily willing to die for each other and don't allow their cicumstances to overcome them. They are hands down one of my favorite couples in fiction. I am so thankful to actually get a complete ending, that is so rare in series. I feel like there are no loose ends in the story and it really was given a feeling of finality. The Bitter Kingdom is a fabulous ending to one of my favorite series- you need to get this one when it gets out- this series was SO worth it!